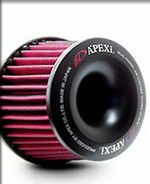 Air filter with minimal air-flow restriction. Dual funnel filter system minimizes intake turbulence. The dual funnel Power Intake evolved from the highly successful Super Intake. Subtle refinements in the design and filter element resulted in a 10% reduction in pressure drop. Utilizing an upper and lower funnel, the Power Intake reduces air turbulence within the filter and creates smooth air flow into the throttle body. The Power Intake is a maintenance-free dry-type air filter and will alleviate the problem of filter oil from "wet" air cleaners interfering with the air-flow meter.